If you are thinking of relocating your family to France, understanding how the school system works will be of importance to you. We hope that our guide to the French education system is of use. When viewing properties with your Leggett agent, feel free to ask them about local schools. All Leggett agents live in the area in which they work and so have excellent local knowledge. Historically, education has been considered a key priority by all political parties in France, and this continues to be the case. Expenditure on schooling is high, with more funds allocated to education than any other departmental budget. Teachers are of a high quality and statistically 90% of those passing through the French education system leave with a qualification; 62% at baccalaureate level. As with many aspects of French life, your local Mairie is the best place to go with any questions that you might have, and is also the place where you enrol your child for school. If the Mairie is unable to help you, they will point in the right direction. Try to ask as many questions as possible. Most Mairies are excellent at assisting local residents with a variety of aspects of life and schools are a large part of this. 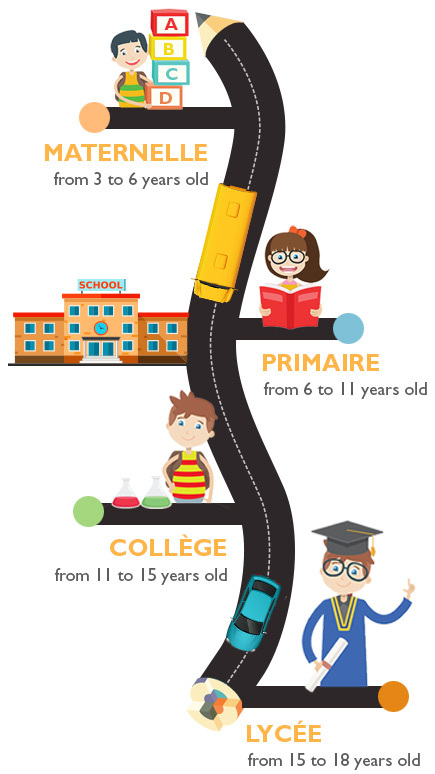 Compulsory education begins at age six, however nursery schools (ecole maternelles) will take children as young as two (providing they are potty trained), with most parents choosing to start their child at school around the age of three. There are also a large amount of state subsidised crèches available to parents of babies and younger children. Nursery education is not just play, although a lot of the learning is achieved through playing. Attendance at an ecole maternelle prepares children well for future school life learning basic numeracy and literacy, as well as life skills such as teamwork, respect for others and imagination. Children are also introduced to art, sciences and physical education. The college curriculum is fairly diverse, increasing in the final two years. Starting with subjects you would expect such as French, Maths, Art, Modern Language, Science, History, Geography, Music and PE; the curriculum expands to include subjects such as Work Discovery (to introduce pupils to thinking about the world of work); Road Safety and Understanding Risks (accident prevention / treatment etc.) Pupils are also required to obtain a certificate in IT. At the end of College, pupils sit an exam called the Diplôme national du Brevet (DNB). Results are based on continuous assessment as well as an exam. Pupils that have opted to pursue a more vocational school career will sit the Certificat Formation Générale (CFG). At the end of college, teachers and parents will decide if it is in the pupil's interest to progress to Lycée. This decision is not based solely on the results of the Brevet, although it will have an influence. There are two different types of Lycée leading to two different types of qualification. Broadly, those thinking of going on to higher education will attend a 'general / technical' lycée, those planning to go directly into the world of work will attend a 'vocational / professional' lycée. Apprenticeship centres are also part of the secondary education system. At 'general / technical' lycée students study the Baccalauréat (BAC). This qualification is an automatic entrance to a French university. The curriculum continues to be broad, leaving students with a wide range of options at university level. At 'vocational / professional' lycee students study the Certificate d’Aptitude Professionelle (CAP) or the Brevet d’Etudes Professionelles (BEP). The BEP is a little more technical than the CAP and can pave the way for further study to achieve a vocational baccalaureate called a Baccalauréate Professionnel. Those undertaking an apprenticeship will spend a large part of their time in industry and will be paid a wage linked to the national minimum wage. See all the french public and school holidays for 2018. French schools work hard to integrate new arrivals and, whatever the age of your child, the school will be keen to help however they can. Language will be of primary concern and wherever possible, most schools work to provide children with extra lessons if necessary. It is important to support your child whilst they are learning the language and not rely entirely on the school. Ensuring that the education system is able to deliver a quality education to disabled children and those with learning difficulties has become a priority in France. As such, systems and facilities are being improved and reassessed. Assistance is given on either a collective or individual basis within the mainstream school or specialist establishment. There are grants available to families who have children with special needs to recognise the additional costs associated with this. Most schools operate between Monday and Friday (only mornings on a Wednesday) from around 8.30am – 4.30pm, although this may vary from school to school. 'Redoubling', or repeating a year, is a fairly common occurrence in France and as such doesn't have the same type of stigma attached to it as in some countries. If a pupil is required to retake a year this will be on the suggestion of teachers following a discussion with the pupil's parents. Most children in France are educated in state run schools. There are private schools, although a lot of these work under contract to the state, mainly running the same curriculum. Most private schools are Catholic, not secular, and the fees are not usually high. It is possible to study in English at an international school in France, some may even follow the UK curriculum. Most international schools are based in Paris, with the second highest concentration being on the Côte d'Azur. International schools are fee paying schools.